All aboard! Kidville Tivoli Village is excited to bring to Las Vegas their fun new music program called Rockin’ Railroad. Rockin’ Railroad is a rockin’ musical adventure that you will not want to miss! Each week Rockin’ Railroad features four live musicians and a musical performance that is geared toward children newborn all the way up to six years old. The crew and “conductor” will take your kids on a musical journey through tempo, rhythm, word recognition, and sound identification. Your child will also meet up with puppet friends along the way as they explore different instruments and musical genres. Baybah, Hubs, and I had a chance to check out a special preview of Kidville’s Rockin’ Railroad music program and we had a blast. It was so cute to see Baybah get into the music. At one point I swear he did the centipede. LOL. Seriously! He loved going on the musical journey and learning about tempo and rhythm. I loved seeing him get into the word recognition segment of the performance when we went on a trip to Grandma’s House. He loved to identify the images that Grandma, one of the puppet friends, held up on the giant flash cards. It was so exciting to see him get so excited about learning. Baybah’s favorite part of the Rockin’ Railroad program would have to be the bubbles. You cannot get him to think of anything else when he sees them!! He and the other kids loved trying to catch them, pop them, and dance on them. There was not a kid or parent in the room that did not have a giant smile on their face. Rockin’ Railroad is a rockin’ musical adventure that you will not want to miss! Register now to secure your spot in Rockin’ Railroad, or their other fun classes including Big Muscles for Little Babies, Savvy Scientists & Awesome Engineers, Kidville Tumblers, and Run Wiggle Paint & Giggle. Classes for the Winter 2012 semester begin the week of January 9th and continue for 16 weeks through the week of April 23rd. Do not live in Las Vegas? Kidville has locations in California, New York, Florida, and more! Find a Kidville location near you. We even got to try out their open gym and have a special treat! The three words that come to mind when I think of Kidville at Tivoli Village are cool, hip, and trendy. I definitely want to take Baybah back to another class, spend more time in their children’s boutique (Oh my goodness, adorable! ), and get his first haircut in their kids salon. He can get his hair cut in an airplane! Kidville is a hit with us! 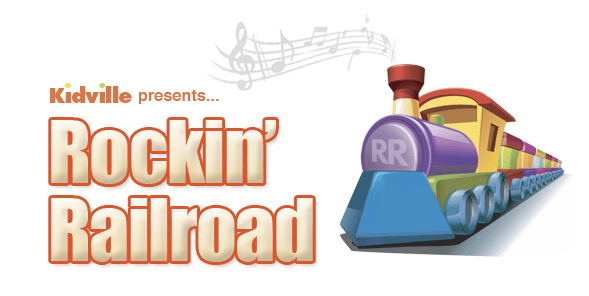 Disclosure: We received an invitation to preview Kidville’s Rockin’ Railroad music program for the purpose of review. All thoughts and opinions are my own. You know what? That is exactly the kind of thing I would have taken my kids to when they were little! Awesome! What fun…great way to foster the arts at a young age. wow that looks like a lot of fun!!!!!! LOVE his curls!! That looks like a blas. Ever town needs a version of them. Had you seen the prior program, The Little Maestros? My wife took my son to Rockin Railroad and was not complementary in the least. Apparently 4 kids and their parents left the class because it was soooo bad. My son and all the students in this class had enjoyed the Little Maestros program for every session up until this one. But, with the licence for Little Maestros expiring on 12/31/11, Kidville ran the last session as Rockin Railroad- with much fanfare and little success. Many parents, including us, found our way to being Kidville Lifetime Members because our kids loved Little Maestros so much. Don’t see the same happening with Rockin Railroad. Is the end of Little Maestro’s Kidville’s version of “New Coke”- one of the greatest marketing blunders of all time?